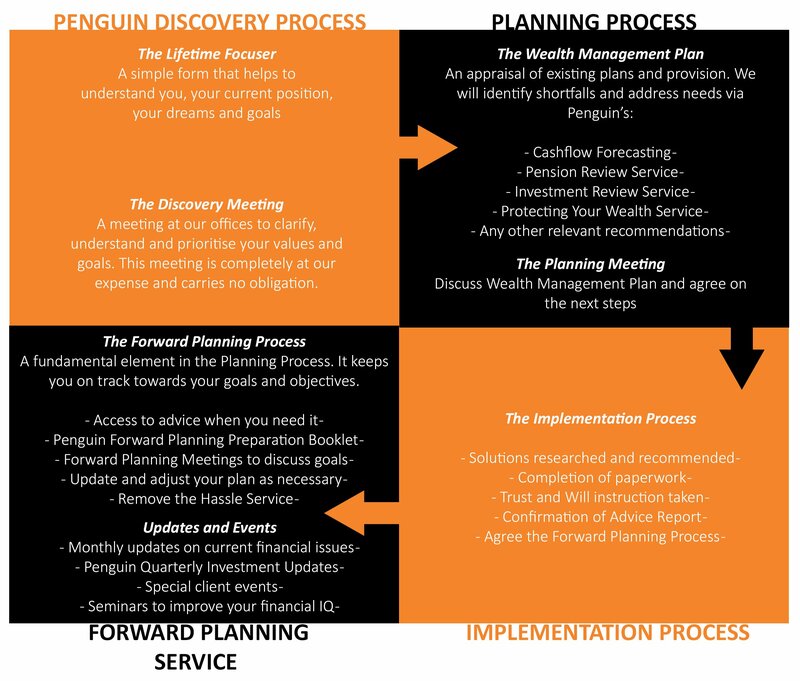 A fixed fee will be charged for the Penguin Planning Process this will be for creating the first draft of your Wealth Management Plan and/or Financial Forecast based on your situation. The Financial Forecast is a service that helps us predict how your financial future looks based on your current situation and what you are trying to achieve for the future. The Wealth Management Plan covers the objectives we have discussed together, as well as subjects we believe appropriate to your aspirations. If you do not feel that the plan we produce and the Planning Meeting has added value to you, then it will come at no cost. If we decided to work together and a product is recommended then this fee can be taken from your product on Implementation. If this service is selected in isolation, under current legislation, VAT will usually be payable on the amount charged. A menu of fees will be included within your Wealth Management Plan. This Plan will detail all fees involved in implementing our advice, including the costs of any Wills and Trust arrangements. Consequently, fees could include activities carried out by specialist third parties. Penguin have a fixed fee for arranging a new pension or investment product of £497 to deal with administration and paperwork. This can be deducted from your product. Penguin will also charge a flat 1% fee (in addition to £497) on any investments we arrange. This is to cover the risk of advice and regulatory cost of providing advice. The fees Penguin charge for implementation contribute towards the costs of regulation, insurance, office costs and the risk of advice. If you invest £250,000 into an Investment plan, for example, and we agree that the above fees are to be paid to us for the advice, then you will either need to pay us a one-off fee of £497 for arranging the product, along with £2,500 (1% flat fee). In this case, £250,000 will be invested. If you choose for the Provider to pay us our fee, then £497 + £2,500 (total £2,997) will be deducted from the investment and £247,003 will be invested. For non-investment business such as Term Assurance, we will usually be paid a commission from the product provider. This will be disclosed to you in an illustration before you go ahead with our recommendation. We will agree with you the fee or amount of commission we will be paid before we make or implement any recommendations. You will receive a quotation which will tell you exactly how much commission we will receive and about any other fees relating to any particular insurance policy. Speciality products such as Venture Capital Trusts, Enterprise Investment Schemes, Business Property Relief Products will be subject to a fee of 3% due to the complex nature and additional risk to the Penguin business of these products. For example, an investment of £250,000 would pay £2,000 over a 12 month period. As your fund value increases or decreases our fee will increase or decrease. Please note: On-going advice, services, and prompt adviser availability is not an inherent part of The Customer Relationship Service. For example, an investment of £250,000 would pay £1,250 over a 12 month period. As your fund value increases or decreases, our fee will increase or decrease. If you do not want or need an on-going service from Penguin, but would still like to discuss your Financial Planning needs with us on an ad-hoc basis, then we can discuss the costs of this as and when required. If you would like to find out more about how Penguin can help you plan for your Financial Future then please do not hesitate to get in touch. A member of our team can book you in for a no obligation Discovery Meeting at our expense.